Beginning in 1910 and continuing through 1912, the American Tobacco Company produced the "1910 Sweet Caporal Pin Set" (ACC# P2) to promote their Sweet Caporal brand of cigarettes. The P2 pins measure slightly less than an inch (about 7/8") in diameter. The 1910-12 Sweet Caporal P2 Set includes a 152 players, pictured on a possible 205 pins. The P2 variations are mostly due to the different font sizes. The player images used for the 1910 Sweet Caporal Set are very similar to the 1911 T205 Set. 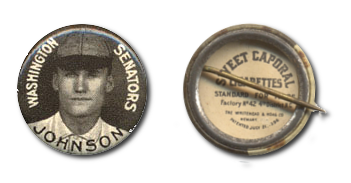 In addition to the player's image, the fronts of the P2 pins include the team name across the top of the pin and the player's last name on the bottom and tucked on the inside the back of the pin is an advertisement of Sweet Caporal Cigarettes. Some of the key Hall-of-Famers from the 1910-12 Sweet Caporal P2 Pin Set are: Ty Cobb, Walter Johnson, Christy Mathewson, Tris Speaker and Cy Young. CLICK HERE if you want to sell your 1910 Sweet Caporal Pins (P2) Baseball Cards.